Down on the Farm: Enjoy Rutgers Ag Field Day this Saturday! Till now, every Hidden New Jersey entry has highlighted a visit that I've made to a notable location in the state, either with Ivan or on my own. Today I'm breaking with that tradition (tradition? This blog is barely four months old!) so you have the benefit of being able to check out an event I believe no proud New Jerseyan should miss: Ag Field Day at Rutgers' Cook College* campus in New Brunswick, to be held this Saturday, April 30. It's the day when our state university's agriculture and bioscience school opens the doors of the livestock barns and earth science labs for some hands-on introduction to our state's ecology and more. I've been going to Ag Field Day for nearly 30 years and while some things have changed, many others haven't. Students continue to groom and handle pigs, sheep, cows and more for the livestock judging shows that are held on the morning of the event. You can still stop by the dairy barn to visit the cows, though I never actually got to see the famous fistulated "porthole cow" who by now has gone to the big pasture in the sky. And don't forget to drop by the Food Science Building to get the yummy Food Science ice cream -- probably a total chemical concoction, but a treat, nonetheless. Other Cook College student organizations still gather at Passion Puddle, the campus pond, to educate and raise money. One of my favorites is the Entomology Club, whose members have long offered bug snacks - cookies with real, edible worms baked into them (you don't taste the worm, but its texture leaves something to desire). In the time since I graduated, more of the environmental sciences are represented at the day, as well. Students and professors who study New Jersey's evolving land use will show you around the state by way of satellite imagery. Check out the marine science building to touch some of the state's sea life and learn more about the restoration of the shore ecosystem. The great thing is that there's something for everyone - students, alumni with young kids, and the rest of us who just like stopping by to enjoy a beautiful spring day on the farm. And if you need a break from science, there's always the New Jersey Folk Festival at Douglass College just a short hike away. 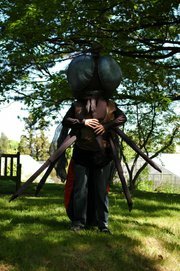 This year, the festival will be focusing on the Kalmyk people of Central Asia who have settled in Howell and Paterson. One can only hope that there will be throat singing! A host of folk performers and craftspeople also display their talents, with a wide variety of handmade crafts available for viewing and sale. I always find great jewelry at the booths. The last Saturday in April was long the day when Cook and Douglass would be the places to be on the Rutgers New Brunswick campus, but that's changed with the introduction of Rutgers Day a few years ago. Now the whole university gets into the act with activities and fun on all of the Middlesex County campuses. If you have enough energy after wandering through Ag Field Day and Folk Festival, take the campus bus over to College Ave or the Busch campus to find out what they have to offer. There's always something fun and interesting, and at the very least, you can visit the President's office at Old Queens (the administration building, not the bar on Easton Ave.). Check it out, and maybe head to Stuff Yer Face afterward. I might just see you there! *Nitpickers will tell you that it's no longer Cook College, it's the School of Environmental and Biological Sciences at Rutgers University, but "SEBS" doesn't quite cut it as a name. And I happen to believe that George Cook is a personage worthy of continued recognition. But I digress... as will many other alumni of a certain vintage who've enjoyed Ag Field Days for lo these many years. once a Self Master cottage. Having endured a business scandal of his own in 1904, former Wall Street brokerage executive Andress Floyd conceived of the colony as a place where homeless, destitute men could learn a new trade and rebuild their self-respect before returning to the world at large. While he appreciated religious missions and the work they did, he claimed that before a man could honestly find God, he had to find his own self-worth. He was also selective in who he admitted to the community. Those who came with recommendations were turned away because Floyd was only looking to help those without friends. He also eschewed hoboes, he said, because they claimed "a thousand homes" and were unlikely to abandon the nomadic life for a steady job. The colony opened in 1908, and the men lived with Floyd and his wife Lillian in the Hoyt Mansion, a large house donated to the cause by watch manufacturer Charles Ingersoll (the same Ingersoll, coincidentally, who constructed houses made from Edison Portland Cement, including nearly a dozen barely a mile away on Ingersoll Terrace). In return for room, board and a 50 cent per week salary, they were expected to work a seven hour day woodworking, weaving rugs or other crafts produced by the colony. Others helped run the household, cleaning, cooking, doing laundry and odd jobs around the mansion and the surrounding 50 or so acres. It's said that more than 100,000 men stayed at the colony over its 20-plus year history, with a fair number of them ultimately finding new jobs outside Self Master once they rebuilt their dignity. Eventually, the colony's success got greater acclaim through articles in the New York Times and other prominent publications of the day. Floyd himself went out on the speaking circuit to relate his rehabilitation philosophy, even appearing at New York's Carnegie Hall. When his past business transgressions came to light, he responded candidly to a Times reporter, saying, "The suffering that was caused through that financial failure determined me to try to live a constructive rather than a destructive life, and finally how difficult it was for myself to get on my feet, I thought how much more difficult it must be for a man without business experience or friends to gain a footing ... I decided to surround myself with a few of these men who need encouragement and direction and to show them that I not only understood them because of my own sufferings but that it is not impossible for a man to restore himself to the confidence of good people by clean and unselfish living and by honest industry." His financial backers were well aware of his past and supported his efforts with the colony nonetheless. According to the Union Township Library website, the Self Master Colony met its demise after the stock market crash of 1929, meaning it went out of business just when it was likely needed most. The 1939 WPA Guide to New Jersey notes that as late as 10 years later, the property still held a dilapidated print shop, two frame buildings, and a loom that was used by the last remaining resident, 69 year-old Michael Moore. The township bought the property in 1938 and sited the municipal building and main library there, along with a small park named for a former town clerk. The Hoyt mansion is lost to history, and that little Girl Scout house is the only structure left, but the names Self Master, Andress, Lillian and Floyd are all memorialized in street names not far from the location of the original colony. This past weekend was bookended with the birth and death of our 22nd and 24th president, Stephen Grover Cleveland. Conveniently, he's buried about an hour away from Caldwell, in what's known as "the Westminster Abbey of the United States," the Princeton Cemetery. Since being established by the Nassau Presbyterian Church in 1757, the Princeton Cemetery has become the final resting place of many of the town's and university's notable personages, regardless of faith. In fact, a healthy number of Stars of David, Sanskrit symbols and other markings are visible among all of the crosses of many Christian denominations. Cleveland gained his Princeton credentials after his second presidential term, when he retired to the community and became a University trustee. He's buried not far from the University Presidents' Plot, which itself is the final resting place of such notables as Aaron Burr Sr. and John Witherspoon, who both led the school in the 1700s. Visitors to Cleveland's burial plot are left with the impression that he's not soon to be forgotten. First, his grave still held a memorial wreath placed there by a military honor guard on his birthday, March 18. And given the shell leis draped over his headstone, it's clear that the Hawaiian monarchists make the cemetery one of their stops on their annual New Jersey pilgrimage. They've also thoughtfully left leis for his wife Frances and their child Ruth, who is said to have been the inspiration for the name of the Baby Ruth candy bar though she died in childhood, long before the product was marketed. Both are also buried in the family plot. a lot of himself, as evidenced here. A few steps away from the Clevelands is a memorial whose placement has caused a fair bit of conjecture. Paul Tulane was a native New Jerseyan, merchant and philanthropist who also had a special interest in the city of New Orleans. As the story goes, Tulane offered a significant donation to Princeton University in 1882, with the condition that the school should be renamed in his honor. When the trustees balked, he instead gave over $300,000 to the Medical College of Louisiana, which subsequently became Tulane University. Allegedly he developed a grudge against Princeton, and ordered that when he died, his memorial gravestone should stand with its back facing Nassau Hall. Indeed it does, but there appears to be no rhyme or reason to why graves in that part of the cemetery are oriented as they are, and there's no uniformity to their directions. I'll give him this, though: it's one of the largest and grandest stones in the lot, so if he was making a statement, he wasn't messing around. And finally, for those who need a little humor in their graveyards, here's one from a more obscure Princeton resident. I wonder: did his family consider him to be a bit of a hypochondriac? I'd be remiss if I didn't mention that Cleveland's birthplace was our second stop of the day. We ventured out early (relatively, for me; late for Ivan) to check the progress of spring migration on Garret Mountain. You'll recall our previous visit to Garret, where we saw but a few birds and even fewer birders. This time could not be more different. The parking lot, while not full by a stretch, held a healthy number of cars sporting various environmental/birding stickers and/or Conserve Wildlife plates. On the way in, we'd already passed a few clusters of optics-sporting strollers, all pointed in the same direction, so it was clear that it would be a productive morning. Indeed, it was. 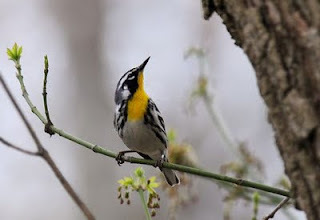 Not far from the park road, near the large pond, we were treated to four different species of warblers - Black and White, Palm, Yellow-Rumped and Pine. Given that they'd likely just flown in, they were treating the trees and brush like the proverbial Turnpike rest area and attacking the food court with gusto. (All together now: "I just flew in from Central America, and boy are my wings tired!") So focused were they on finding good munchies that they allowed us to get close enough for a good view without binoculars. It was, no joke, reminiscent of the old parakeet aisles at Woolworth's. All that was needed was the display of Hartz Mountain bird food. Much to my regret, I didn't have my camera on hand to capture the scene; these are totally adorable, tiny birds. After a winter of spotting mostly dull-colored species, it was nice to see flashes of bright yellow flitting around the budding greenery. After this experience I truly understood why birders flock (no pun intended) to Garret in the spring, as a relatively short stroll netted us, conservatively, about a dozen species. In all, with just about two hours of scouting, Ivan picked up something like 30 different kinds of birds, and it's early in the season. You can imagine what kind of results a birder could get in a day later in the spring. Who is the only U.S. president to have been both born and buried in New Jersey? Who was the only man to have served as president twice, in non-consecutive terms? Who's the only president to be married in the White House? Who is Cleveland, Ohio named after? The answer to the first three questions: Grover Cleveland. And the answer to the last question: not Grover Cleveland. * Before Saturday's torrential rains began to fall, Ivan and I made a visit to the birthplace of our 22nd and 24th president, on Bloomfield Avenue in Caldwell. Now a state park, it's one of those sites that's long been on my 'to visit' list. We learned far more than we expected and saw things we never anticipated. The house itself was formerly the manse (minister's home) for Caldwell's First Presbyterian Church. Cleveland's father, Richard Falley Cleveland, served as the congregation's pastor from 1834 to 1840 before moving to a new church in Fayetteville, New York. The future president lived in the manse to the age of three and spent his formative years in upstate New York. At the age of 16, Grover lost his father, prompting his departure from school and the start of his work career. Eventually moving to Buffalo, he studied for and passed the bar exam without having attended college or law school, and then entered public life. Gaining a reputation for honesty and integrity, he was elected to positions of increasing importance, first as sheriff of Erie County, then mayor of Buffalo and next the governor of New York. Later, of course, he was elected president of the United States as a Democrat, which was remarkable for the time. A house tour will bring you through the first floor, which is largely where the Cleveland family lived during their stay in Caldwell. While most of the artifacts weren't the family's belongings, they're of the same vintage, giving you a good idea of what it was like to live in the small house. The parents' bedroom, Cleveland's actual birth place, is marked by a decorative plaque, and it draws the inevitable question of where Grover and his seven brothers and sisters (at the time) slept. According to our very informative guide, they all shared a common bedroom on the second floor, no doubt huddling together to conserve the limited heat. While the presbytery no doubt provided comfortable accommodations for their clergy, we can pretty safely assume that in the 1830s, central heat wasn't part of the deal. Looking into the parents' bedroom, I noticed an orange plastic lei draped atop the future president's small cradle. What connection could the house possibly have to Hawaii? As it turns out, Cleveland's second term occurred during a pivotal time in the history of the island chain, and his actions made him a hero to monarchist Hawaiians. American businessmen had already overthrown Queen Liliuokalani and were seeking annexation to the United States. President Benjamin Harrison's administration had already sent the necessary legislation to the Senate, but Cleveland blocked it, effectively stalling the annexation until after the conclusion of his term. While the inevitable happened in 1898, several Hawaiians make an annual pilgrimage to Caldwell to honor Cleveland for his stalling move. If you'd like to meet them and learn more about their devotion, they're expected to visit again on April 30. The last room of the house is a treasure trove of artifacts from Cleveland's political career, including campaign posters, buttons and other paraphernalia. There's lots of great stuff there, but I was most taken by the wedding cake. No, it wasn't a recreation: they have two pieces of the actual cake from the reception after he and the considerably-younger Frances Folsom tied the knot in 1886. Seeing shades of Miss Havisham, I asked the guide how and why someone would save a 125-year-old piece of cake. I mean, I get its significance as an artifact of the only presidential wedding at the White House, but come on. She explained that the custom was to have two wedding cakes: one for the attending guests to enjoy on the day of the ceremony, and another to divide and send to invitees who were unable to attend. The second cake was usually a firmer, fruitcake-like confection, so it would hold up during shipping. One wonders if this is where the traveling fruitcake tradition started. The piece we saw didn't look all that much different from what my Aunt Edna used to send us every year at Christmas time, so perhaps we have Grover Cleveland to thank for popularizing the concept. No doubt, there's still a piece of his cake being regifted every year during Yule season. As we've experienced during many of our other Hidden NJ jaunts, we left the Cleveland home with our curiosity piqued about yet another Garden State notable. For one, we knew we had to make it down to visit his gravesite in Princeton. * Rather, the city in Ohio was named for the president's distant relative Moses Cleaveland, a late 18th century surveyor and politician. Sandy Hook is rife with abandoned and decaying gun batteries and supporting structures. Look around closely enough, and you're bound to find pillboxes and quonset huts among the larger batteries and office buildings. Some of them are in pretty decent shape, while others look as if they were intentionally wrecked to prevent explorers from going within and possibly getting hurt. Then there are the mysterious treasures you can only see with a ranger or an intrepid volunteer. Back in November 2009 I was fortunate to join a caravan of other curiosity seekers on a "Weird Sandy Hook" tour. We were promised entry into restricted areas, and I wasn't disappointed. Right at dusk, we were escorted to a gate just off the main road, on the bay side of the hook. As the gate was unlocked and we drove through, our volunteer guide warned that if we chose to return to the area on our own, unescorted, we would be apprehended and arrested. The Park Service is very serious about this particular "no entry" sign. Our bus stopped at Kingman and Mills, the two bayside World War Two-era batteries that are still reasonably intact, but we weren't going there, quite yet. We had a short hike ahead of us. Walking along the beach, an abundance of slipper shells crunched under my boots. Wood poles lined the water's edge; they were the last vestiges of the dock which once stood there. We were headed to the structures that dock served: the bunkers that held the ammunition for the nearby batteries. The sand that had once obscured the bunkers had eroded over time, leaving two brick and concrete buildings with curved roofs. The one that lacks a door is the voodoo bunker. Before we entered, our guide warned us that we might encounter the carcass of a sacrificed animal inside, and indeed, a several-days slaughtered chicken was decaying in the corner. But that was just the confirmation of what we'd come to see: the voodoo bunker. Our lanterns and flashlights exposed several large pieces of spray painted artwork on the walls, all apparently done by Santeria practitioners. The creatures looked oddly pre-Columbian with a touch of Keith Haring, and undoubtedly had some sort of significance in whatever rites were practiced in the bunker. But who did them, and how did they find this isolated, virtually unreachable part of the park? Our guide posited that the artists had canoed across Sandy Hook Bay under cover of night, originating from Highlands or perhaps someplace further down the bay. Though the artwork was fascinating, it was also a little freaky, especially as the evening skies outside were darkening. There were probably about 40 of us inside and around the bunker, but I still had that eerie apprehension of being caught at someone's sacrificial altar. Unfortunately my photos were less than ideal, given the lack of illumination and the difficulty in getting a clear shot with so many people milling about. These should give you at least a tiny understanding of what's out there. As I said, the voodoo bunker is in an area of Sandy Hook that's closed to public exploration, but there's always a chance the National Park Service will run another tour. Check their events website for a quarterly schedule of activities, and call ahead for more information. There's always something interesting on their calendar! The history at Sandy Hook is a big draw for my repeated visits, but the real reason for my recent trip was to check in on the osprey. I've been doing this for years, stopping by the bayside observation deck across the road from the Spermaceti Cove visitor center to see if the ol' fish hawks were nesting on the usual platform. They've become more and more common since I started my vigil, but it still warms my heart to see them pairing off and cultivating their broods. This year I've been a little impatient, hoping that some of February's warm weather spurts had somehow encouraged the osprey to show up a few weeks early, but they waited until their usual late March date to arrive. As I approached the visitor center parking lot from the access road on Saturday, I saw one of the nesting pair fly off, no doubt looking for lunch. I was hoping to get some decent photos of the pair, but the platform was out farther than my lens could get an acceptable shot. Besides, nothing interesting was happening there, beyond a squawking conversation once the second osprey returned to the nest. Undeterred, I went to my other reliable nesting site: Officers Row. That's the group of houses on Fort Hancock, facing Sandy Hook Bay, where the base's lieutenants, captains and commanding officer lived with their families. With only a few exceptions, they've been closed up since the Army left in 1974, and they're silently deteriorating in the salt air. It breaks my heart to see them slowly rot, but at the same time it's gratifying to see a little bit of life nurtured atop the chimney of one of the houses. I only just noticed them last year, and when I checked over the winter, the nest was still there. That bodes well for continued habitation, as long as the conglomeration of sticks and detritus doesn't get blown off the chimney by a gust off the bay. I parked my car behind one of the adjacent houses and pulled out the camera and long lens, kicking myself for not bringing the tripod. As I got out of the car, I heard the splat of bird droppings hitting the car roof. Welcome to Officers Row, Sue. This was going to be fun. I knew from last year's observation that the osprey would probably be a bit pissed at me for getting within camera shot, which in this case is the sidewalk in front of the house. They don't seem to realize that it's a long way from there to the top of a chimney on a three-story house. I figured I'd give it five or ten minutes and take my chances. I got several clicks off as one of the osprey came by with lunch for the other, but much of the activity seemed to alternate between evasion and intimidation. First, the birds left the nest and flew far off behind the house, beyond the parade ground, back by the sergeants' family housing. Then after several minutes they came back closer to me, flying in front of the house, over the road and multi-use path and out to the bay. I was fortunate not just to get the photos, but to get a closer view of the pattern on the underside of their extended wings through the binoculars. I'll admit it was kind of intimidating to see them hover directly above me. Kinda made me feel the way the fish would, if they could see up to the sky to see they're being stalked. And after all, you never know if the osprey will poop on you, and osprey poop stinks, probably like fish. Though I had positive intent, I started feeling a bit guilty for scaring them from their nest, so I packed up and hit the road. Out of habit, I looked quickly to my right just before passing the bayside platform. Distracted by a large flash of white, I was delighted to see a great egret perched atop a cedar on the side of the road. Good thing nobody was driving directly behind me; I pulled to the shoulder and grabbed the camera to squeeze off a few shots. I've seen egrets perched in deciduous trees, but never in a cedar. There's a first time for everything, I guess. Given the beautiful weather this past Saturday, it was a natural to head down to Sandy Hook for some wandering. It's one of my favorite places to go, because it combines a couple of my favorite things: a great natural setting and a fascinating history. This week's jaunt was a solo Sue expedition, since Ivan had to pull some pretty heavy overtime at work. And yes, I fit in some history with the birds since two of the site's aging weapons batteries were open to visitation. A squadron of nuclear weapons ringed major U.S. cities during the Cold War, undetected by the vast majority of Americans. Until the development of intercontinental ballistic missiles in the early 70's, the last defense America had against Soviet incursion was the Nike Ajax missile, and then the nuclear-tipped Nike Hercules. And many Nike bases were located in suburban neighborhoods, not always or entirely known by the residents of the split-level ranches nearby. Most of the bases have been dismantled, but there's still one in pretty decent shape at Fort Hancock on Sandy Hook. The base was transferred to the National Park Service in 1974 after the Department of Defense decommissioned it. I've visited the Nike base a few times, on tours run by veterans who served at the base. There are just two missiles on display farther down the road, unarmed, and the golfball-shaped covers aren't on the radar platforms anymore, but the control centers are still there. About the size of a small Ryder rental truck, they could easily be pulled up and trucked to another location, just like an old-time diner. Oh, and they're incredibly ugly and depressing inside, kind of like a submarine. The Park Service is reportedly working to stabilize and restore the base, but right now they're letting visitors check out the trailers and other parts of the base in their current, crappy condition. Though the electronics have been removed, you can still get a sense of the technology that once tracked and controlled nuclear weaponry. It's pretty wild to think that there's more powerful circuitry in my smartphone than there was in that whole set up. In fact, our guide pulled out a huge floppy disc, the older, bigger brother to the 5-1/4 floppies I remember from my early computing days. Oh, and while there are still plenty of switches and dials on the control panels, someone has thoughtfully removed "the button." I guess you can never be too careful. I also got a kick out of an old phone booth on the base. It still had a rotary phone with a 201 number, though that area code hasn't been used in Monmouth County for 20 years. It seemed weirdly out of place, a relic of normalcy in a kind of surreal doomsday environment. My thoughts turned to the scene in the satirical Dr. Strangelove, when the one sane officer left on the base is reduced to using a pay phone to contact the Pentagon during an attack ... and Ma Bell won't spot him the 55 cents for the long-distance call. You have to wonder if the Fort Hancock phone booth is there for the one reasonable thinker left. And, of course, there's always Maxwell Smart and the secret entrance to CONTROL. In any case, the Park Service is keeping it there for eventual restoration. Come to think of it, there are probably already kids who don't even know what a phone booth is, having never lived in a world without cell phones. As I took a few photos, I realized that had I gotten into the base with a camera 40 years ago, I'd have landed in a military jail. Now photos of the equipment are posted here, for all to see, without any penalty to me. Maybe some Russian blogger like me has posted photos of nuke base phone booths, too. Glasnost. Wanna buy a lighthouse? We'll throw in the oystercatchers for free. A sage person once asked me: if a seagull flies over the bay, does that make it a bagel? That's not why we found ourselves on the shores of Raritan Bay, but it's an interesting question, nonetheless. Following our visit to Perth Amboy, we stopped at the Raritan Bay Waterfront Park in South Amboy to tuck a bit of birding into the day. Ivan had heard that some little gulls were spotted there (and no, he didn't sing "Thank Heaven for Little Gulls"), and heck, when you have the chance to go to the beach in South Amboy, you don't pass it up. What I didn't realize was that the beach also offers a perfect view to one of New Jersey's little known lighthouses, the Great Beds light. It's a classic 'spark plug' design, set off into the water, just where the Arthur Kill meets the bay. Its name is derived from the great beds of oysters which once dominated the bay floor, straddling the watery New Jersey/New York borderline. In 1868, New York ceded the underwater land on which to build the light, ultimately setting off yet another boundary squabble. It seems that the Empire State had granted the federal government a nice piece of the Garden State. Today that doesn't seem like much of an issue, but back then, when shellfish were still being harvested there, it caused quite a stir. 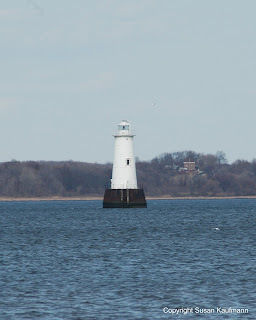 Eventually, the dispute was settled in New Jersey's favor, and the light was built. First painted red, then brown and finally white, it was hit by passing barges and other craft at least 10 times in the early 1900s. Unmanned since 1945, Great Beds is now run by automation, meaning that it rarely, if ever, gets human visitors. The light was placed on the National Register of Historic Places in 2008, which, unfortunately, doesn't mean it will be protected. In fact, the Coast Guard has declared it excess to its needs and offered it to other federal agencies and educational concerns, among others, but found no takers. The General Services Administration put it up for auction just a few weeks ago, so its fate is now up in the air. If you've got at least $10,000 and a boat and want a little solitude, it might be a pretty nice weekend place, though I have no idea what condition the living quarters are in. The outhouse, for example, was taken out many years ago. As for the birds, there apparently were no little gulls to be seen, though Ivan did pick up a few Bonaparte's gulls as he scanned the usual suspects on the water. 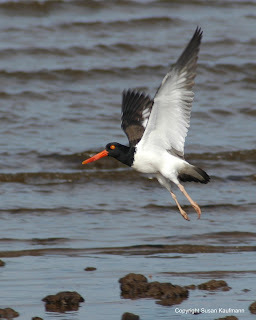 I was particularly taken by a pair of American oystercatchers who were foraging around the shallow waters at the edge of the beach. Between their dark orange beaks and reddish circles around their eyes, they're quite an interesting sight, especially when contrasted with the monochromatic plumage of the surrounding gulls. Maybe it's just a coincidence, but I also noticed quite a number of good-sized oyster shells on the beach. As recently as last year, experimental seed oysters were placed in the bay, but they were removed on order of the state Department of Environmental Protection, the rationale being that poachers would steal and sell the oysters, which were alleged to be tainted with harmful bacteria. While the Raritan is still recovering from years of pollution and neglect, it's a good sign that shellfish are starting to thrive, and hopefully new beds will be established in coming years. Perth Amboy fits a lot of history into a very small space, notably downtown at City Hall and the adjacent Surveyor General’s office. The sign in front of the two structures notes the significance of the town in New Jersey – and, in fact, US history. Looking at the mansard roof and whitewashed brick exterior of city hall, you’d be hard pressed to place it at its original construction date of 1713, but it is, indeed, one of the, if not the oldest public buildings in continuous use in the United States. 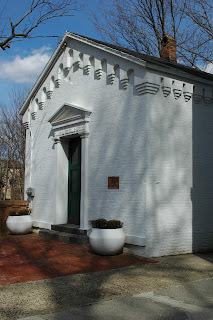 The current exterior was part of a renovation and enlargement project done in the 1870s, and the original town courthouse structure is encased within it. Notably, this was the site of the first occurrence of a black man voting legally in the United States, just a day after the enactment of the 15th Amendment of the Constitution. Thomas "Mundy" Peterson cast his ballot here on March 31, 1870 in a referendum on changing the town's charter, and he later became a member of the commission formed to make the revisions. He was also the first African American in Middlesex County to serve on a jury and was an active member of the Republican Party. Across the street there’s an open space that might qualify as a town square if it weren’t a circle. In addition to a majestic George Washington statue donated by the town’s Scandinavian residents in 1896, there’s a reproduction of the Liberty Bell which was presented to the people of New Jersey by US Treasury Secretary John Snyder after touring the state in a savings bond drive in 1950. 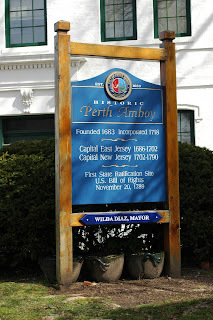 Interesting, isn’t it, that it ended up in Perth Amboy instead of Trenton? 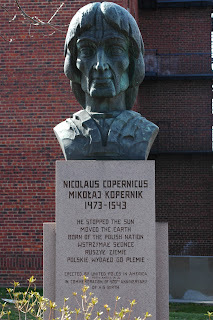 Of all the statuary we saw for the day (oh, including the rather dashing Earl of Perth, for whom the town is named), I most liked the large, stylized bust of Nicolaus Copernicus. 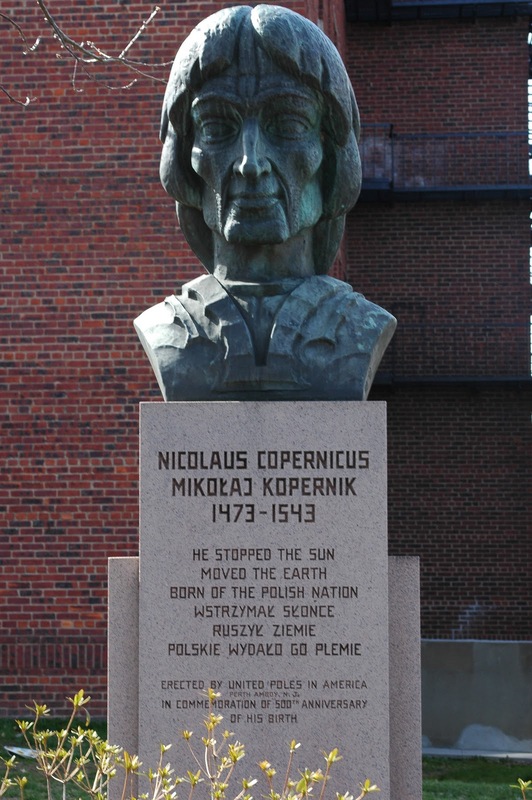 Presented by members of the city’s sizeable Polish community, its column reads: “He stopped the sun/Moved the earth.” Pretty nice epitaph, don’t you think? After reading that one, Ivan and I mused over what Mama Copernicus must have made of her childrens’ relative accomplishments. For my part, I wondered if she continually chided her other son for not stopping the sun like his brother. Ivan, on the other hand, opined that she probably said that moving the earth was nice, but not nearly as nice as the sturdy bookcase her other son made for her. Either way, she probably wasn't completely satisfied. It’s always something, right? Run a couple of history nuts past an old church and see what happens. If those nuts are Ivan and me, chances are that you’ll be spending some time walking around a graveyard. That’s exactly what happened on the way from the Perth Amboy waterfront to city hall. The Kearny family, Perth Amboy branch. St. Peter’s Episcopal Church is nestled in a residential neighborhood, and its current 1852 structure doesn’t quite do justice to its history as the oldest parish of its faith in the state. 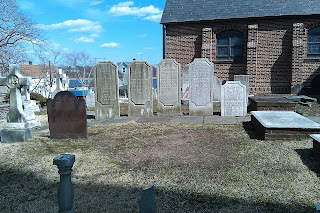 Starting in 1685, it’s welcomed Perth Amboy residents both notable and obscure, and not surprisingly, its history is reflected in the gravestones that populate the entire churchyard. One of its earliest stones dates back to the 1600s, and its most recent appeared to have been placed just a few days before our visit, as the soil in front of it was freshly disturbed. Set at the top of the bluff as it is, the property must have offered a beautiful view of Raritan Bay before the surrounding homes were built. In fact, it's said that colonists used the tower of the original church as a lookout point to spot Tories across the Arthur Kill on Staten Island. The church itself is an impressive Gothic Revival structure with stained glass windows that combine biblical and colonial themes, but we weren't focused on the building. We spent a fair amount of time wandering among the memorials, Ivan looking for Civil War veterans as I scanned for any interesting names. We found both, though it appeared that someone on the cemetery committee had confused the Revolutionary War and World Wars for the Civil War and put commemorative medallions in the wrong places. 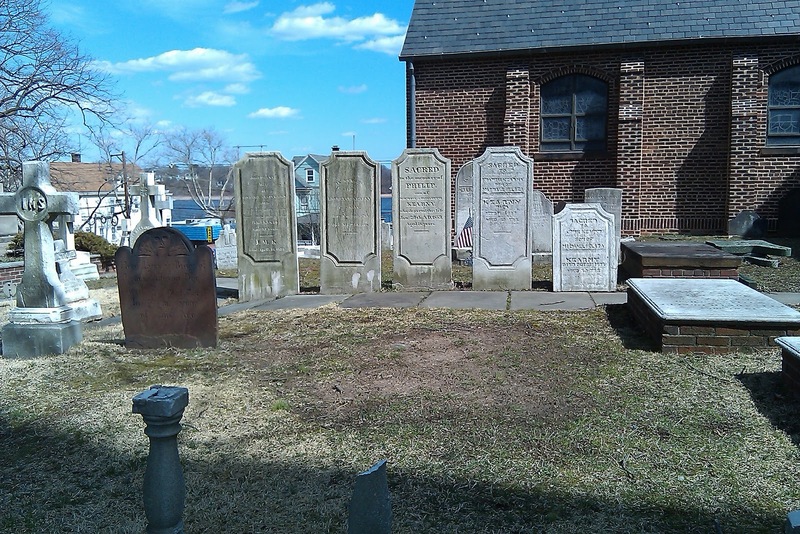 Very close to the church wall, Ivan found a series of stones marked with names of various members of the Kearny family. Could these be relatives of Major General Philip Kearny, the self-described “one-armed Jersey son-of-a-gun” who led the First New Jersey Brigade through the War Between the States, the hero for whom the town of Kearny, New Jersey was named? It appeared that the family was notable in Perth Amboy, judging from the fact that a street and historic home were named for them, but could it be that he, himself, was born there as well? Unfortunately, no, he was born in New York City but was related to the Perth Amboy family and a real credit to his adopted state. He moved to a mansion overlooking the Passaic River in New Jersey after having lost his left arm during the Mexican-American War. Between his military exploits and some rather adventurous personal travels, he’s quite an compelling character. He’d make a fascinating blog entry on his own, but for the time being, you might want to check out a quick biography. Also buried in the yard are Thomas "Mundy" Peterson, the first black voter in the United States under the 15th Amendment, and Rev. Robert McKean, founder of the Medical Association of New Jersey, the oldest such organization in the country. 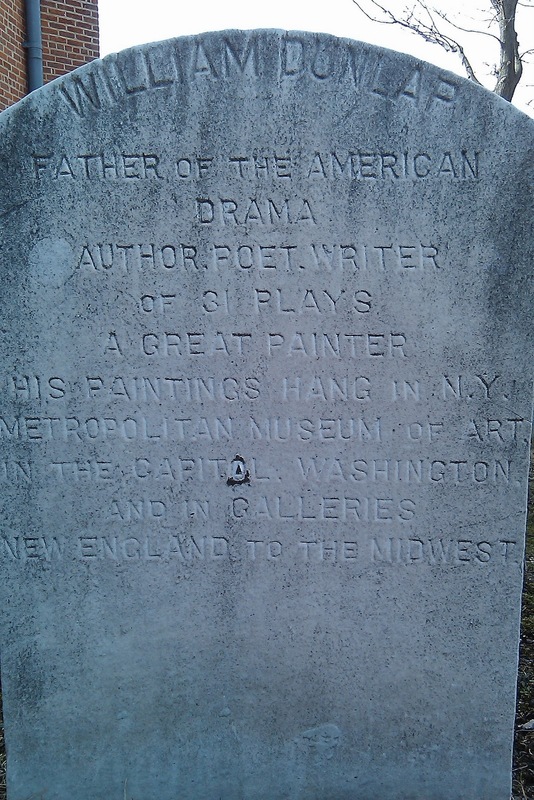 We also found a rather informative gravestone for William Dunlap, playwright, producer and artist, who was born in Perth Amboy in 1766 and died in 1839. Today, Perth Amboy is known as a gritty industrial town whose most productive days are behind it. That reputation belies a storied past going back to the earliest days of settlement in New Jersey. Visit the community, and you’ll find it’s the site of the oldest public building still in use, the first casting of a vote by a black American after the ratification of the 15th Amendment, the first Episcopal parish in the state, and oh, yeah, the first capital of New Jersey. As is typical on some of our more vague trips, we weren’t sure where exactly to go once we got off the highway and into town. (Planning? What’s that?) All I knew is that there was historic stuff tucked somewhere among the bodegas and laundromats. Not knowing where exactly to go, we headed toward the waterfront. After all, that’s where most colonial cities started. 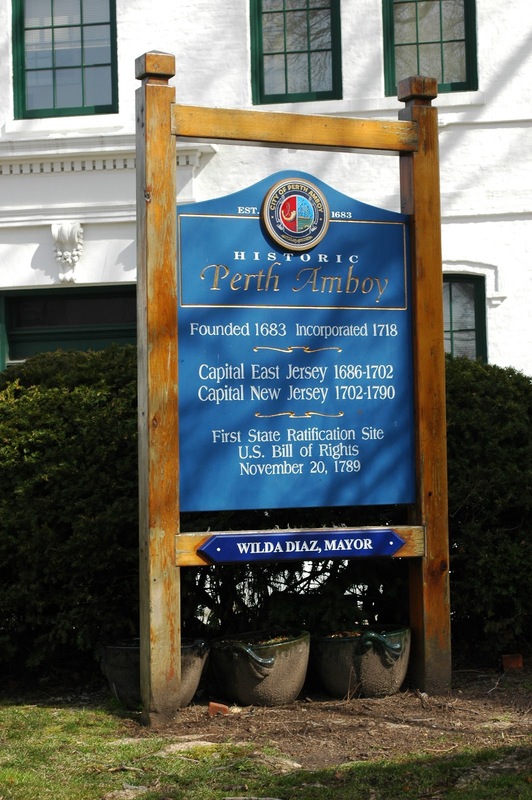 Indeed, Perth Amboy became an important colonial city because of its prime location on Raritan Bay and the adjacent Arthur Kill that runs between New Jersey and Staten Island. In its heyday, this brought any number of shipping concerns and, eventually, substantial manufacturing to the city. Today, the waterfront is dominated by some nice houses up on the adjacent bluff, a small marina, and a very pleasant walkway running alongside the Arthur Kill. Given the time of year, it was pretty quiet when we visited, with just a few people fishing off a pier, but one could imagine that the area might hum with activity once the pleasure boats are back. 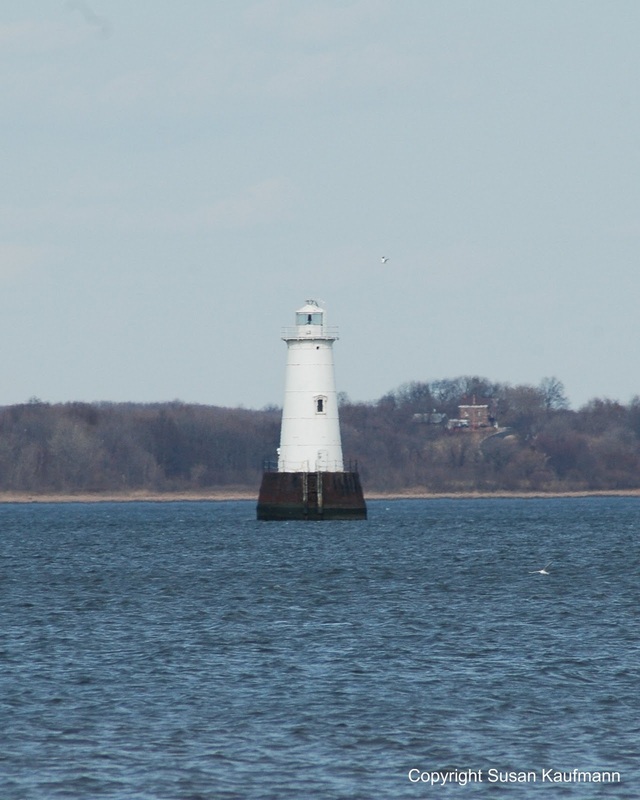 Back in Revolutionary times, Perth Amboy’s location at the mouth of the Raritan River made it the ideal spot for the state capital, and a prime target for occupation by the British. 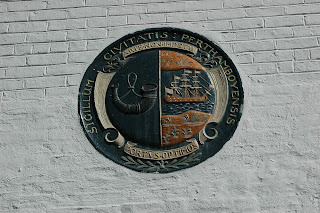 Looking at how closely Staten Island sits across the Kill, it’s not surprising that the Redcoats would see Perth Amboy as a steppingstone from the New York they captured to the colony they tried but failed so many times to capture. Indeed, the two sides alternated possession of the town, and it was where loyalist Governor William Franklin (son of patriot/Renaissance man Ben) was arrested in June 1776 by the Americans, who took his home for their own use. Ol’ Ben also visited Perth Amboy with John Adams and Edward Rutledge just a few months later on their way to Staten Island to discuss an end to the war with Sir William Howe. Presented with the option of surrender, the patriots refused, but their actions allowed Washington and his troops additional time to retreat safely to New Jersey after the Battle of Long Island. Though Ellis Island is right in the middle of New York Harbor and hosts more than two million visitors a year, it qualifies as a hidden New Jersey story. That's not an April Fools joke -- the Island of Hope and Tears has a legitimate Garden State connection. 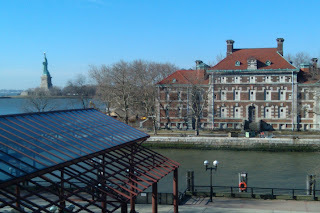 Few people know that Ellis Island is in two states: New York and New Jersey. Both Ellis Island and Liberty Island are on the New Jersey side of the state boundary that tracks down the Hudson River and through New York Harbor. Way back in 1834, the states entered into a compact that put the islands under New York jurisdiction, and both states agreed that the surrounding waters were New Jersey territory. In any case, the islands are federal property and were hosts to forts defending the harbor before becoming home to the Statue of Liberty and the immigration station. Over the years, as immigration boomed and more space was needed for medical facilities to handle thousands of sick newcomers, the US government enlarged Ellis Island and built more than 30 buildings there. What was once about 3.5 acres became 27.5, consisting of fill taken from Manhattan and Brooklyn during the excavation of the New York City subway system. Not much was said about Ellis Island's provenance until the immigration station was restored and opened as a museum in 1990. In stark contrast, the many buildings on the island's south side remained in disarray, and questions came up about what would come of them. Would they be torn down in favor of new construction, perhaps a shiny new hotel or casino? 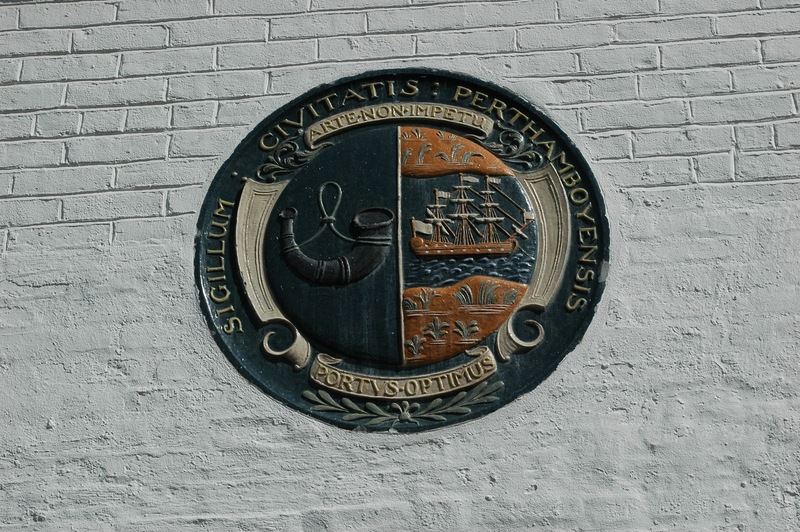 Given that the island is just a half mile from Jersey City, the state of New Jersey wanted a strong voice in any decision about the island's future. And certainly, monetary issues came into play, too. As it stood, visitors paid New York sales tax on anything they bought at the souvenir stands and snack bars on Ellis and Liberty Islands. Who would get the tax revenue from any additional profit making enterprises on the island? on the New Jersey side of the island. The issue was settled in the time honored American tradition: a law suit that reached the US Supreme Court. In their infinite wisdom, the Justices looked back to the 1834 compact for guidance. Noting that the states had agreed that the naturally-occurring islands were New York land in New Jersey territory, they carefully drew the state boundary to include the original land within the larger, man-made landmass we know today. While the vast majority of the immigration museum rests within the footprint of the original island, tiny bits rest within New Jersey. And more than 80 percent of the total island, including the entire south side hospital complex, is part of the Garden State. And the status of the south side buildings? Of course, as always, we get the fixer-upper. 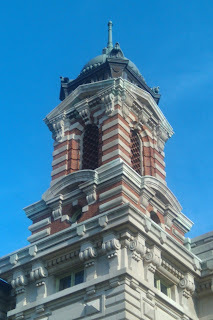 The non-profit Save Ellis Island is working with the National Park Service to raise funds for restoration of the hospital complex, with an eye toward opening an institute on world migration and health. All of the buildings are stabilized to prevent further decay, and one, the Ferry Building, is already open for guided tours.